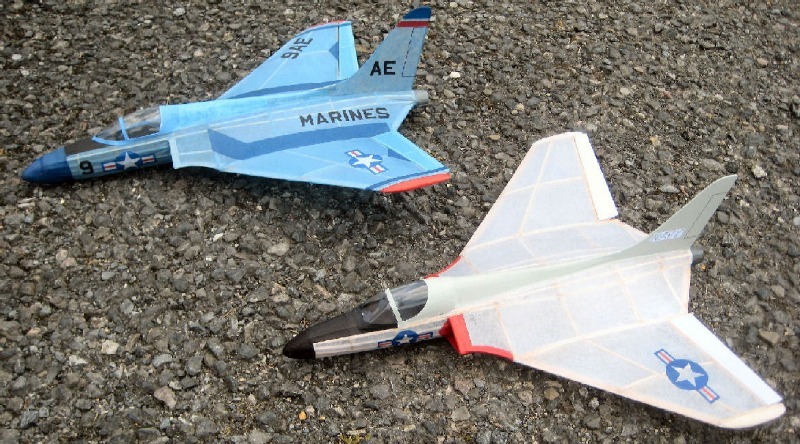 Those of you who have read 'John's Jetex Journey' will be as impressed with John Holman's Keil Kraft Flying Scale models as I was. Above: John's Skyrays. The EB version is the one behind. Slightly larger than the KK kit, it is otherwise identical. Very tasty indeed! John flew his models at Old Warden, and very well they went too. The first two are no more than 'cartoons' of the real thing, though the Jigtime model, made of pre-printed sheets is undoubtedly attractive. Albert Hatfull's design is for Jetex 100 and not very accurate. Which left the Ray Booth's Skyleada design. 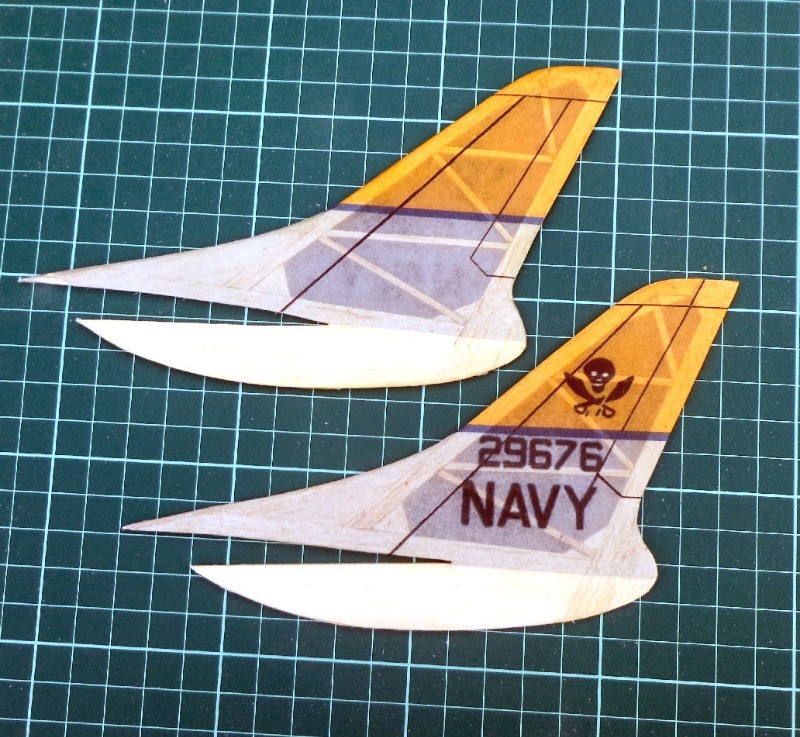 This is not perfect (the canopy is the wrong shape for the stated version) but it is pretty good, the plan shows all the parts - wing ribs and fuselage formers- and - if you are so inclined - there is a very nice kit available from the Vintage Model Company. 1. What modifications, if any, (extra stringers, hinged elevons etc) will be made to the structure ? 2. 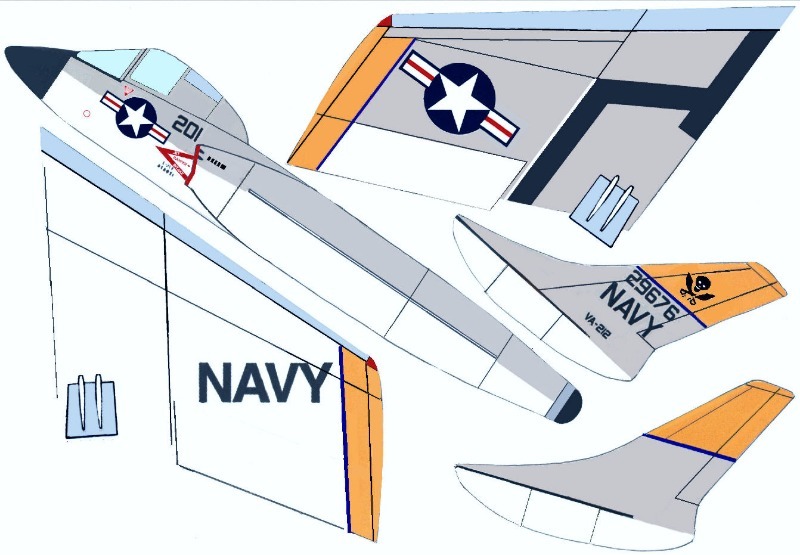 Will I change the outlines of any parts - for example the nose and canopy?to conform better to the real thing? If (2) I will have to make a plug and mould a canopy - a procedure I find as stressful as painting! We will see. Watch this space for progress! I was pleased with these. The ink had not run and the depth of colour quite good. I like the translucent effect and it certainly beats a plain coloured finish. It is, though a lot of work and I had to print off several copies of the fin before everything matched to my satisfaction. 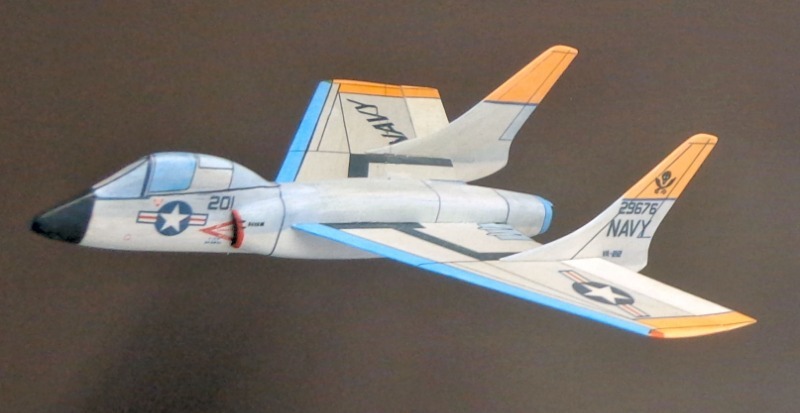 The 'real' Cutlass canopy is quite large and distinctive and adds a lot of character to the aircraft, so I modified the Skyleada plan to match the production Cutlass. 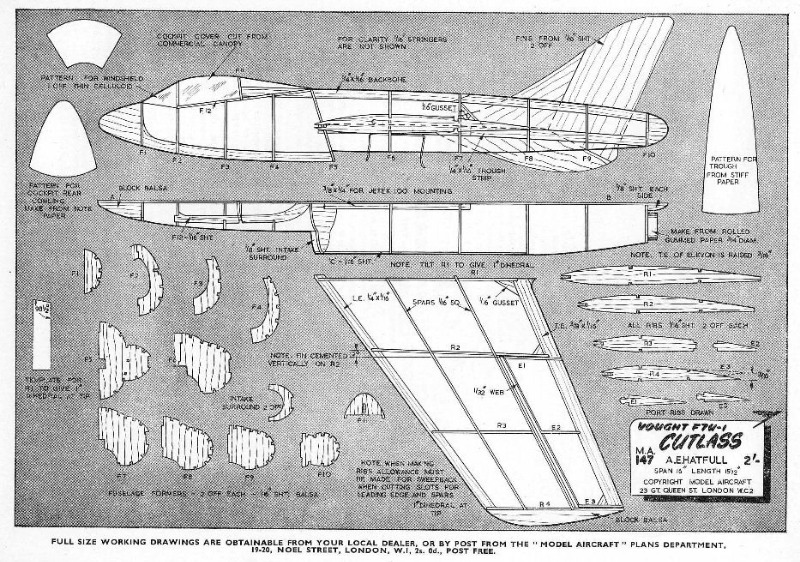 The plan, I think, shows that of the very first prototype. 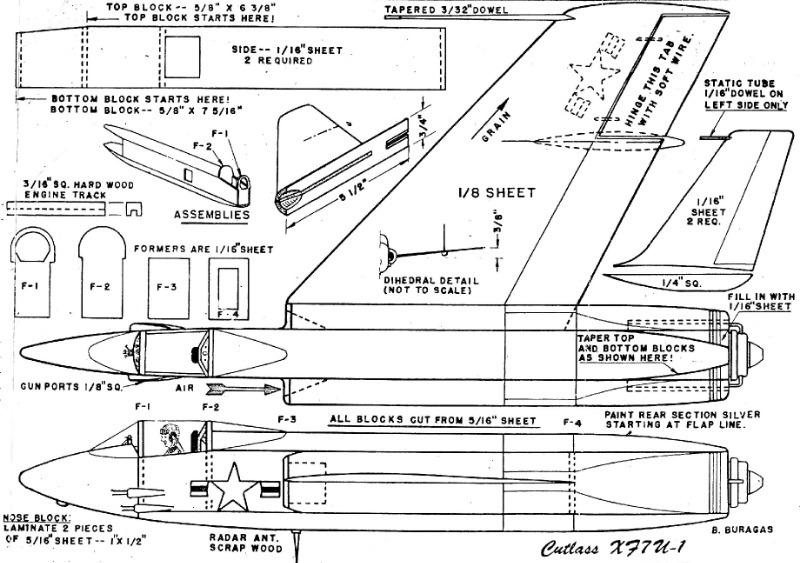 Above: plan modified to depict the production Cutlass. The canopy and nose add a lot of character I think. I made a plug for the modified canopy. It was larger than is usual for me and too big for my homemade vac box! and this worked OK after some experiments with temperature and pressure with 0.5 mm clear PETG sheet..
Not too bad (for me) Buffed up with a bit of 'Brasso' and dipped in 'Johnson's Klear' (thank you Howard) it should be OK.
You will see I have modified the leading edge spar, added two extra spars with a bit of webbing and diagonals for the elevons (I didn't want these warping). These are glued in place according to the plan with 5/32" of 'up'. Mine are hinged. So this is progress so far. Whether covering the much larger area of the wing with printed tissue is as relatively trouble free as the wings remains to be seen. 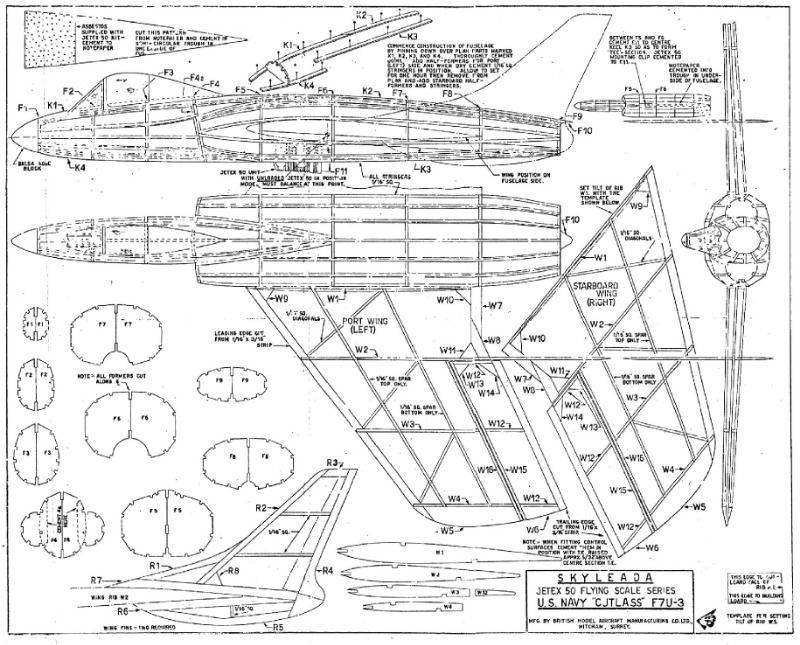 This is coming along very nicely, I much prefer the big canopy and am looking forward to seeing how you get on covering the fuselage, lots of panels I guess. 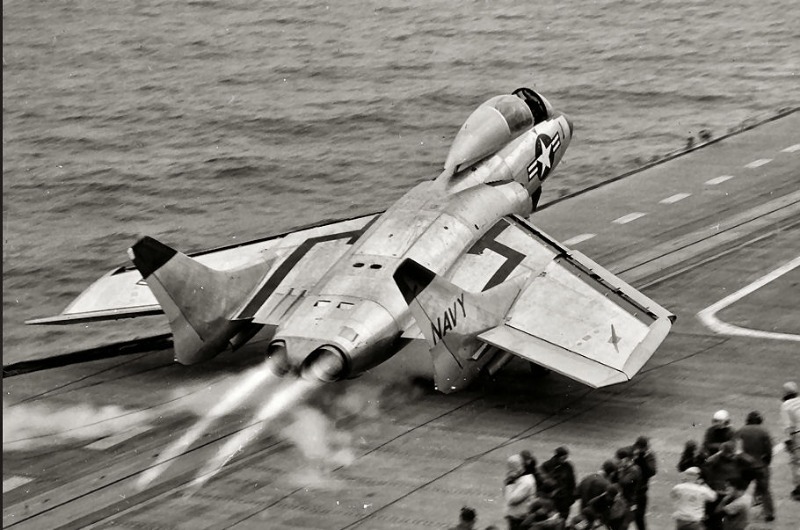 To me it has always been a fascinating aircraft and your colourful choice of subject is going to look very attractive. 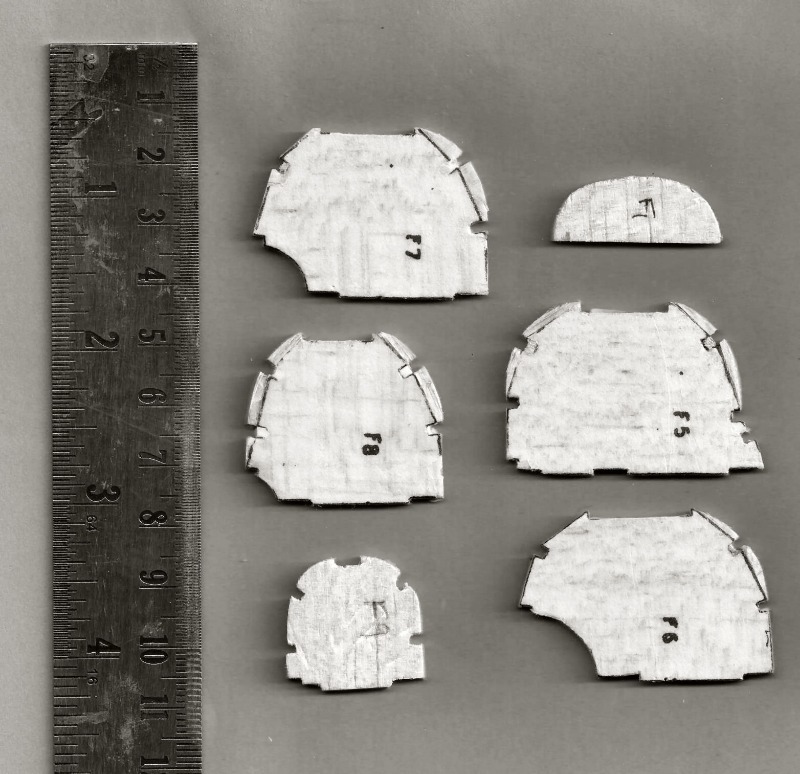 I transferred the templates of the fuselage formers by photocopying the relevant part of the plan (Skyleada plans, in contrast to Keil Kraft plans show all the parts, a great advantage) on to tissue and doping this on to light quarter grain 3/32 (not 1/16") balsa. not too difficult, but tiresome all the same! The right hand side is then added. 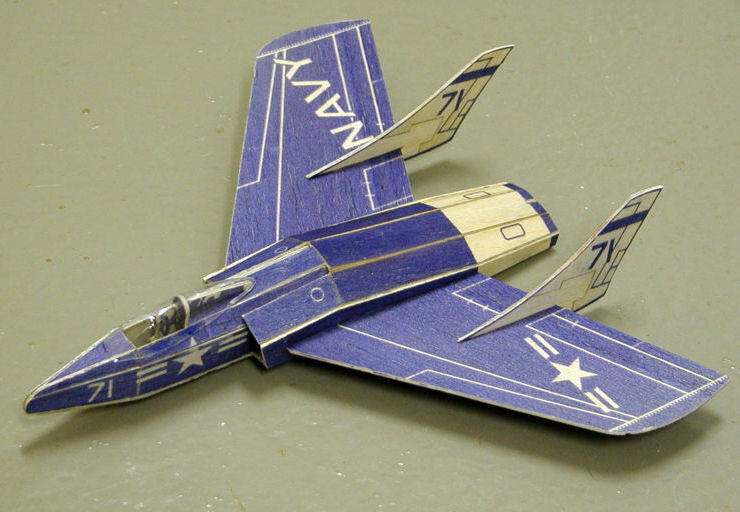 Using 3/32" balsa makes the potentially tricky step easier I find. Everything seemed to line up nicely. Next job is to add the stringers. But first I'll have to work out where they all go - it's not that clear from the plan! I'll also be adding a fair bit of sheet infill - another deviation from the plan. 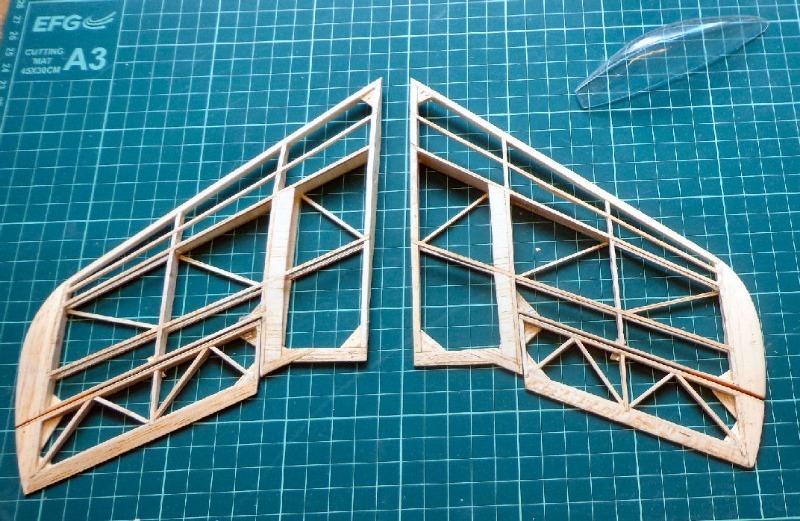 I've added 1/16" balsa stringers, cut from some hard balsa sheet I had to hand. The bought '1/16" stringers were a tad undersize and were loose in the slots. Note I've added an extra light stringer to support the trough. 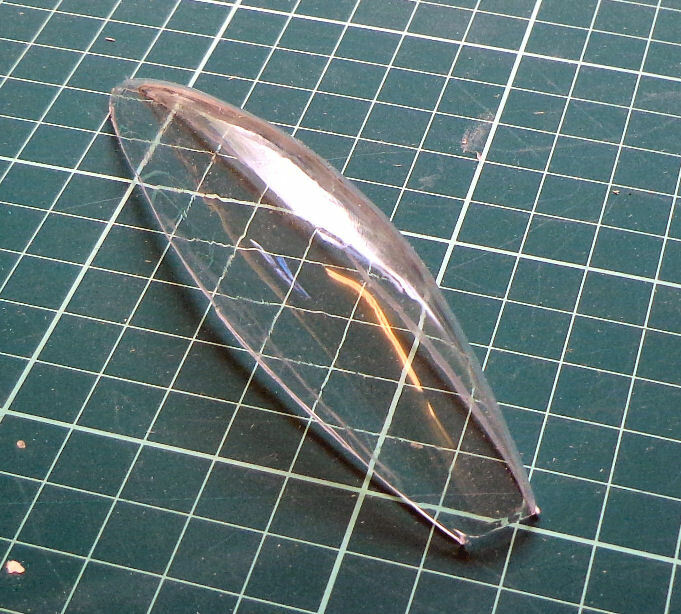 The fuselage will need will need at least a couple of stringers on the corners - the radius of the curve is noticeable on the real thing and I want to to keep my oh-so-carefully-modified fuselage cross section a feature on the model. The stringers have added 3 grams so far so a few more will be OK.